Pixie is short tempered and sometimes funny plus caring and loves caring for animals. touched by were creatures.Charm has white gleaming fur and blue eyes. Pixie likes animals, pets, blood and spirits allthough she hates were creatures and wooden spiky things also pixie is terrified by slayers and fire/sunlight. 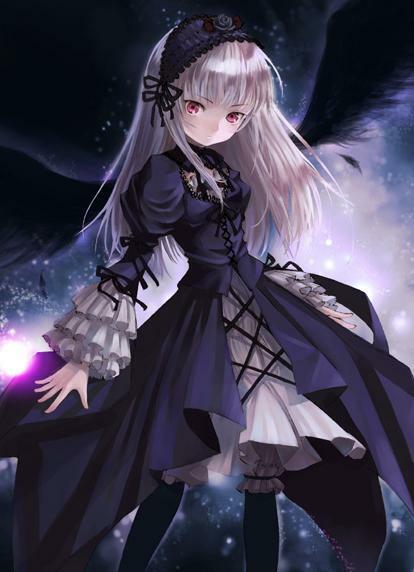 Pixie has long blonde hair, that is always down and pink eyes always wears old fashioned clothes that are black white and red.She also has really pale skin. Born in 1835 in a town near London her parents were wealthy and cared for her but as she got older they started to become weird.At first they told her to drink more blood and to kill people.Pixie did'nt know what to do.Finally one night she went out hunting and spotted a group of slayers heading towards her house. She managed to warn her father but her mother did not leave the house alive.H'er father gave her the family arloom that was her mothers the blood pendent.Her father no longer thinking that they were safe her took her to live in the mountain with the vampire clan.As his own father had shown him the way before in times of great need.